This is the busy season of chess, with lots going on in the scene. 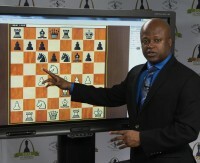 Scattered thoughts, like pawns, need attending: Maurice Ashley is in town, looking for millionaires. The first and only African-American GM is at the Chess Club and Scholastic Center of St. Louis handling duties as the Resident Grandmaster, giving lectures, teaching lessons — and no doubt polishing up anyone who likes both chess and money, as he continues to promote the Millionaire Open, set for Las Vegas in October.